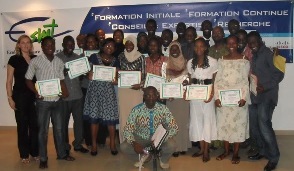 Dr. Christelle Scharff was involved as an instructor in the bootcamp that took place at ESMT. 1st place – lambj provides information about Senegalese wrestling. It permits users to suggest fights and vote for their preferred wrestlers. Geo Educ permits to learn geographic information about Senegal, Togo and Benin and provides a quiz to evaluate users’ knowledge. Togou Mame provides recipes of the most popular dishes and drinks of Senegal. Geo Sen provides tourists with information about the most popular tourist sites and teaches some words of Wolof.